Rare poster for 1936 feature version of the serial (note tagline), reissued as "Rocketship" in 1949. Flash Gordon is a 1936 science fiction film serial. Shown in 13 chapters, it was the first screen adventure for the comic-strip character Flash Gordon that was invented by Alex Raymond only two years earlier in 1934. It tells the story of Flash Gordon's visit to the planet Mongo and his encounter with the evil Emperor Ming the Merciless. Buster Crabbe, Jean Rogers, Charles Middleton, Priscilla Lawson and Frank Shannon played the central roles. In 1996, Flash Gordon was selected for preservation in the United States National Film Registry by the Library of Congress as being "culturally, historically, or aesthetically significant". The planet Mongo is on a collision course with Earth. Dr. Alexis Zarkov takes off in a rocket ship to Mongo with Flash Gordon and Dale Arden as his assistants. They find that the planet is ruled by the cruel Emperor Ming, who lusts after Dale and sends Flash to fight in the arena. Ming's daughter, Princess Aura, tries to spare Flash's life. Aura helps Flash to escape as Zarkov is put to work in Ming's laboratory and Dale is prepared for her wedding to Ming. Flash meets Prince Thun, leader of the Lion Men, and the pair return to the palace to rescue Dale. Flash stops the wedding ceremony, but he and Dale are captured by King Kala, ruler of the Shark Men and a loyal follower of Ming. At Ming's order, Kala forces Flash to fight with a giant octosak in a chamber filling with water. Aura and Thun rescue Flash from the octosak. Trying to keep Flash away from Dale, Aura destroys the mechanisms that regulate the underwater city. Flash, Dale, Aura and Thun escape from the underwater city, but are captured by King Vultan and the Hawkmen. Dr. Zarkov befriends Prince Barin, and they race to the rescue. Dale pretends to fall in love with King Vultan in order to save Flash, Barin and Thun, who are put to work in the Hawkmen's Atom Furnaces. Flash, Barin, Thun and Zarkov create an explosion in the atomic furnaces. Dr. Zarkov saves the Hawkmen's city in the sky from falling, earning Flash and his friends King Vultan's gratitude. Ming insists that Flash fight a Tournament of Death against a masked opponent, revealed to be Barin, and then a vicious orangopoid. Flash survives the tournament with Aura's help, after she discovers the weak point of the orangopoid. Still determined to win Flash, Aura has him drugged to make him lose his memory. Flash recovers his memory. Ming is determined to have Flash executed. Zarkov invents a machine that makes Flash invisible. Flash torments Ming and his guards. Barin hides Dale in the catacombs, but Aura has her tracked by a tigron. Aura realizes the error of her ways, and falls in love with Barin. She tries to help Flash and his friends to return to Earth — but Ming plots to kill them. Ming orders that the Earth people be caught and killed, but Flash and his friends escape from the Emperor's clutches, and Ming is apparently killed in the flames of the "sacred temple of the Great God Tao". Flash, Dale and Zarkov make a triumphant return to Earth. Buster Crabbe as Flash Gordon. Crabbe had his hair dyed blond in order to appear more like the comic strip Flash Gordon. He was very self-conscious about this and kept his hat on in public at all times, even with women present. He did not like men whistling at him. Jean Rogers as Dale Arden. Rogers also had her hair dyed blonde, "apparently to capitalize on the popularity of Jean Harlow". The actress and the character were both normally brunettes. Charles B. Middleton as Ming the Merciless. Ming is characterised in the mold of Fu Manchu in this serial. Richard Alexander as Prince Barin. Alexander helped to design his own costume, which included a leather chest plate painted gold. Theodore Lorch as Second High Priest. James Pierce as Prince Thun. "Big Jim" Pierce played Tarzan in Tarzan and the Golden Lion (1927). According to Tarzan creator Edgar Rice Burroughs he was the perfect portrayal of Tarzan. He married Burroughs' daughter Joan Burroughs on 8 August 1928 after meeting her on the set of that film. As a wedding present, Burroughs included a clause in his next contract that stated that Pierce must play Tarzan. This contract later led to the filming of the serial Tarzan the Fearless. Despite the contract Pierce did not star after he was tricked into stepping aside in favor of fellow Flash Gordon actor Buster Crabbe (the first serial role for the future "King of the Serials"). Early film fan historians have claimed that actor Lon Poff, playing the first of Ming's two high priests, died shortly after production began and so was replaced by Theodore Lorch. In fact, however, only Poff's character died, or rather was killed off by Ming in an act of fury and replaced by Lorch's High Priest; but the scene was cut from the final print. Poff did not die until 1952. According to Harmon and Glut, Flash Gordon had a budget of over a million dollars. Stedman, however, writes that it was "reportedly" $350,000. A lot of props and other elements were recycled from earlier Universal productions. The watchtower sets from Frankenstein (1931) appeared as several interiors within Ming's palace. The Egyptian statue from The Mummy (1932) became the idol of the Great God Tao. The laboratory set and a shot of the Moon rushing past Zarkov's returning rocket ship from space came from The Invisible Ray (1936). Zarkov's rocket ship and scenes of dancers swarming over a gigantic idol were reused from Just Imagine (1930). Ming's attack on Earth used footage from old silent newsreels. An entire dance segment from The Midnight Sun (1927) was used. and much laboratory equipment came from Bride of Frankenstein (1935). The music was recycled from several other films, notably Bride of Frankenstein, Bombay Mail, The Black Cat (both 1934), and The Invisible Man (1933). Exterior shots, such as the Earth crew's first steps on Mongo, were filmed at Bronson Canyon. Crash Corrigan, who would later be the lead in other serials, wore a modified gorilla suit as the "Orangapoid". Flash Gordon was intended to regain an adult audience for serials. It was shown in 'A' Theaters in large cities across the United States. Many newspapers, including some not carrying the Flash Gordon comic strip, contained half and three-quarter page feature stories in their entertainment pages with Alex Raymond drawings and stills from the serial. Flash Gordon was the first outright science fiction serial, although earlier serials had contained science fiction elements such as gadgets. Six of the fourteen serials released within five years of Flash Gordon were science fiction. The serial film was subsequently released in a 72-minute feature version in 1936, which was reissued in 1949 as Rocket Ship. A different feature version of the serial, at 90 minutes, was sold directly to television in 1966 under the title Spaceship to the Unknown. For syndication to TV in the 1950s, the serial was renamed Space Soldiers. 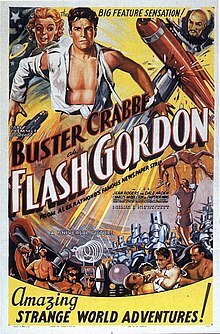 so as not to be confused with the newly-made, also syndicated TV series, Flash Gordon. Eddie Parker doubled Buster Crabbe. Flash Gordon was Universal's second-highest-grossing film of the year, after Three Smart Girls, a musical starring Deanna Durbin. However, the Hays Office objected to the revealing costumes worn by Dale, Aura and the other female characters. In the two sequels, most of the female characters were thus dressed more modestly. Reviewing the film for the Radio Times Guide to Films, Alan Jones described Flash Gordon as "non-stop thrill-a-minute stuff as Flash battles one adversary after another" and stated that it was "the best of the Crabbe trilogy of Flash Gordon films". ^ Tracey, Grant. "Images Journal Flash Gordon article". ImagesJournal.com. Images Journal (4). Retrieved August 2, 2010. ^ a b c d e f g h i Harmon, Jim; Donald F. Glut (1973). "2. "We Come from 'Earth', Don't You Understand?"". The Great Movie Serials: Their Sound and Fury. Routledge. pp. 29–35, 38. ISBN 978-0-7130-0097-9. ^ Essoe, Gabe (1972). Tarzan of the Movies. Citadel Press. pp. 56–7, 77. ISBN 978-0-8065-0295-3. ^ a b c Stedman, Raymond William (1971). "4. Perilous Saturdays". Serials: Suspense and Drama By Installment. University of Oklahoma Press. pp. 97–100, 102. ISBN 978-0-8061-0927-5. ^ Cline, William C. (1984). "2. In Search of Ammunition". In the Nick of Time. McFarland & Company, Inc. p. 17. ISBN 0-7864-0471-X. ^ Cline, William C. (1984). "3. The Six Faces of Adventure". In the Nick of Time. McFarland & Company, Inc. p. 32. ISBN 0-7864-0471-X. ^ Reid, John Howard (2007). Science-fiction & Fantasy Cinema: Classic Films of Horror, Sci-fi & the Supernatural. Lulu.com. pp. 71–72. ISBN 1-4303-0113-9. ^ Al Williamson and Peter Poplaski, "Introduction" to Alex Raymond, Flash Gordon: Mongo, the Planet of Doom. Princeton, Wis. : Kitchen Sink Press. 1990. ISBN 0878161147 (p. 5). Wikimedia Commons has media related to Flash Gordon (serial). This page was last edited on 12 March 2019, at 16:00 (UTC).